I’m definitely known to drop the F word --------especially in terms of agility. Yup I’m talking about foundation, foundation, foundation! Sometimes, I feel like some people feel foundation is like the other F word..people should not use it! For years, I have tried to push Foundation Seminars and Classes….and not many people were interested. Many people believe that once their dog can do obstacles, they don’t have to do foundation exercises and they just run full courses all the time. So many things wrong with this way of thinking. Agility isn’t all about doing obstacles. The path between the obstacles and getting your dog on the correct path is arguably more important than teaching obstacles. 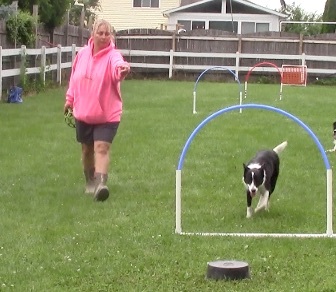 There are so many groundwork foundation exercises that you can do without any agility equipment to teach your dog to follow your cues and teach them path-work. I am a huge proponent of letting puppies be puppies. 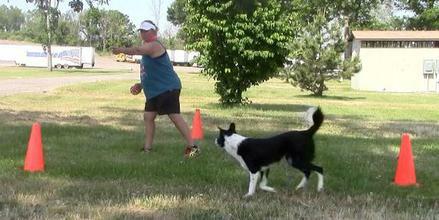 My goal is to have my dogs running well into their double digit years, so I have lots of time to teach agility. Instead, I concentrate on life skills and groundwork foundation exercises. I’ve added a bunch of new groundwork foundation exercises to my training protocol and have been doing them with my puppy. At 11 months, the only agility equipment my puppy has seen are hoops. While he has not seen real agility equipment besides hoops, we have been working groundwork foundation exercises to teach him to follow my body language and learn my cueing system. I see a huge difference in Inspire’s commitment to obstacles and distance already because he understands my body language and cues by all the groundwork foundation exercises that we have been doing. I am in no hurry to teach my puppy obstacles. Over the past months, we have worked start-lines, targeting, cone work, and foundations for contacts with a pad. But more importantly, we have worked on teaching him to understand and follow my cues and understand path-work. Once I am ready to do more obstacles in a row and teach him obstacles, he will already understand the path I am drawing and how to read my cues. I have already worked discriminations training with him without any obstacles but 2 buckets! But he is learning to following my pathwork and cues. Over the next six months, I will add more obstacles and start doing more sequencing with him. I will start working on specific foundation skills like directionals- GO, HERE, SWITCH, OUT, COME. I will work more distance—lateral and forward sends. I will start teaching him a tunnel soon; start board work for his contacts and in a few months start some jump training and even later on will start weave training. We will continue to work foundation exercises. I am a skilled trainer by nature. Even with my elite dogs, it’s very rare that I will run a full course. I want to sharpen my skills and be able to handle that specific skill from different locations on the course- next to my dog, behind my dog, laterally away from my dog, in front of my dog etc. So I will move myself to all different locations and work that skill. I am never where I think I will be all of the time so I want to be prepared for being in any location on course! So I practice it doing foundation exercises! It is very common for me to work a 7 or so obstacle sequence in a training session so that I can work that sequence from different locations. As I prepare for NADAC championships I always go back to my foundation skills as well even with my bonus dogs. Just yesterday I worked one hoop wraps from all different locations because I’m sure we are going to see some wraps this year so I want to be able to handle them from all locations. Please remember that foundation skills are the building blocks of great teamwork!! It is never too late to go back and work foundation skills. Dogs love it and your teamwork, path-work and skills will improve! !